HARRIS COUNTY (November 13, 2018)- Drivers experienced morning delays in northeast Harris County after an 18-wheeler caught fire on the Eastex Freeway. 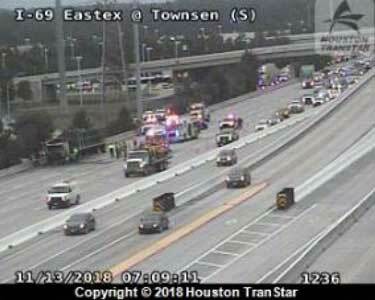 According to Houston TranStar, the big rig ignited around 6:30 a.m. near the US-59 and Townsen exit. All southbound lanes were blocked and the feeder served as an alternate route. There were no injuries reported. An investigation will be opened to determine what caused the truck fire. If you are heading towards north Houston, be sure to check out our live traffic updates for the best commute in Houston. If you or a loved one were involved in a truck accident, it is important to contact a legal expert to help you evaluate your options. Call (713) 987-7111 or send us an email to discuss your car accident injury case.